Paige Marshall knew more about tragédie lyrique than she did teaching, but operatic roles were difficult to come by and a job was a job. She and her new boss, Larry De Weese, would be working with kids from Prospect Glen High School’s show choir at a “choir show camp.” Paige did have a background in musical theater and dance and Music in Motion would be her very own choir, even if she wasn’t going to be performing any arias for them. Fourteen kids? Seriously! That snooty woman, Felicia Frederickson didn’t do much for her either, but it was nice to eat every now and then. Prospect Glen had high hopes of winning the competition, but Paige’s welcome would soon be short-lived. Even poor Larry was having problems. Greg Lucas took a jab at him claiming that he, the stud muffin, would show Paige just how to lead a successful group. Her Aunt Millie’s poodle, Killer, had better manners than that guy. It looked like ego-clashes just might be a problem, but the show must go on ... and it did. Sorta. Mr. Lucas was later found in the auditorium deader than a piano with loose pins. Greg wouldn’t be tinkling the ivories or singing with that microphone cord wound around his neck. Paige, who discovered the corpse, soon found herself at the “back of the auditorium trying to pretend a dead man wasn’t giving a recital on stage.” Detective Michael Kaiser quickly took one of the students, Eric Metz, into custody. It looked like the case was cut and dried, but was it? Greg had hit on Eric’s girlfriend, Chessie, but he wasn’t the only one who wanted to strangle the man. Try half the school. Devlyn O’Shea, the drama coach who wouldn’t have minded doing the job himself, was determined to help Paige. “Paige, you’ve been nothing but trouble since the minute I’ve laid eyes on you.” Detective Kaiser may have had a point, but would she be able to clear Eric before she became the next victim? 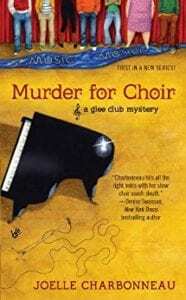 This fun, first in the series glee cub mystery will hit the high notes with readers. I was unexpectedly surprised with how solid and interesting this cozy mystery was. Paige’s character was well-developed and, in spite of the fact that Detective Mike claimed she was a “complete amateur,” she always managed to be one step ahead of him. She’s definitely an interesting and capable “amateur” to watch out for. The light touches of humor hit the spot as did the hint of future romance. No doubt Paige and the cast of characters at Prospect Glen High School will be tripping the light fantastic and I’ll be anxiously awaiting the next in the series! Quill says: Watch out for the prima donna of the cozy world because Paige Marshall of Prospect Glen High School has just hit center stage!